Hosted by the lovely ladies Sherry at Young House Love and Katie at Bower Power! After yesterday’s failure, I wasn’t left with much time to scrap something new together. 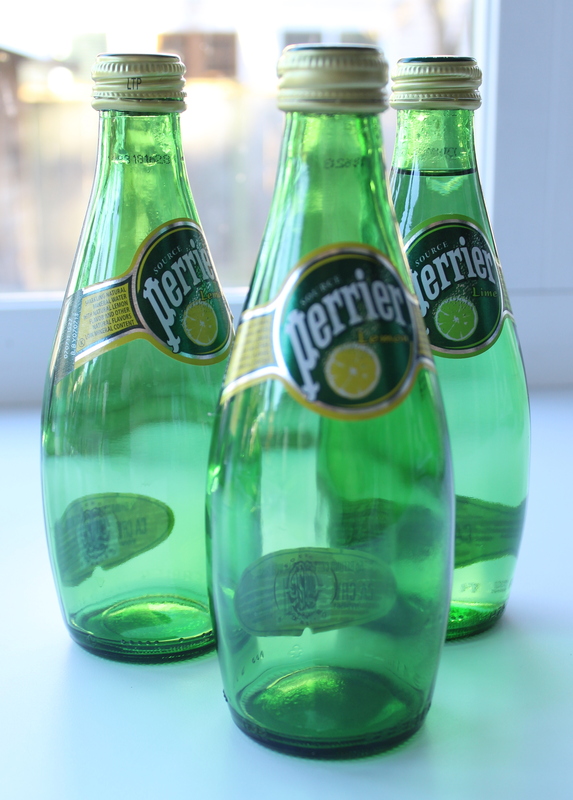 I still had Perrier bottle bud vases on my mind…what else am I to do with my little collection? This is another pin that I have had on my DIY board for about a month. 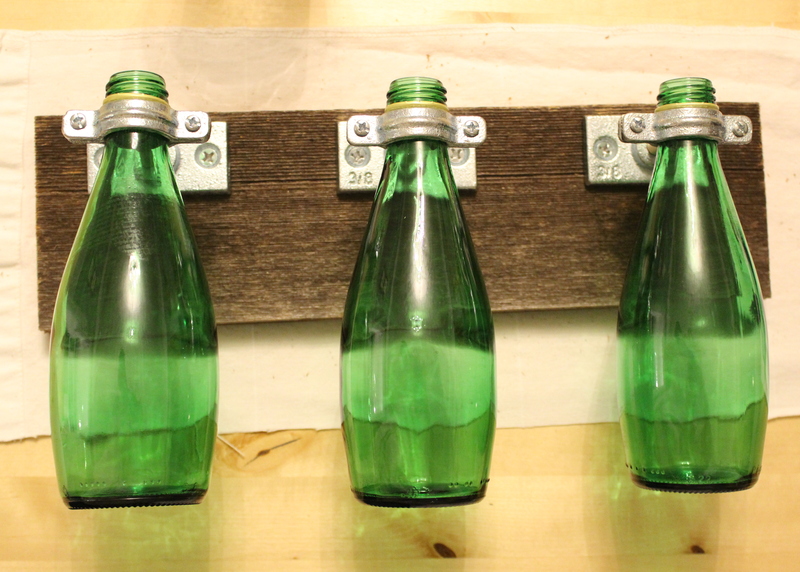 I keep going back to it, it’s such a great use of old bottles, and rustic wood…which I just happen to have a garage full of. I got most of my supplies at Lowes. For some reason they were incredibly hard to track down, so I finally ordered them online and picked them up at the store. My wood I had on hand from my shed demolition last spring. I love the color and texture of it. It’s worn and dark, the perfect contrast to soft spring blooms! 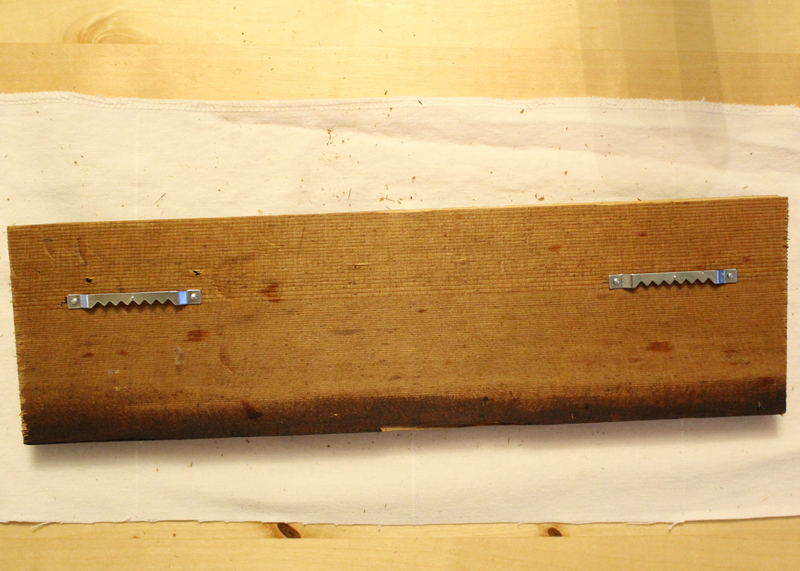 I cut the board down to 18″, aligned, and spaced the flanges about 1/4″ from the top. 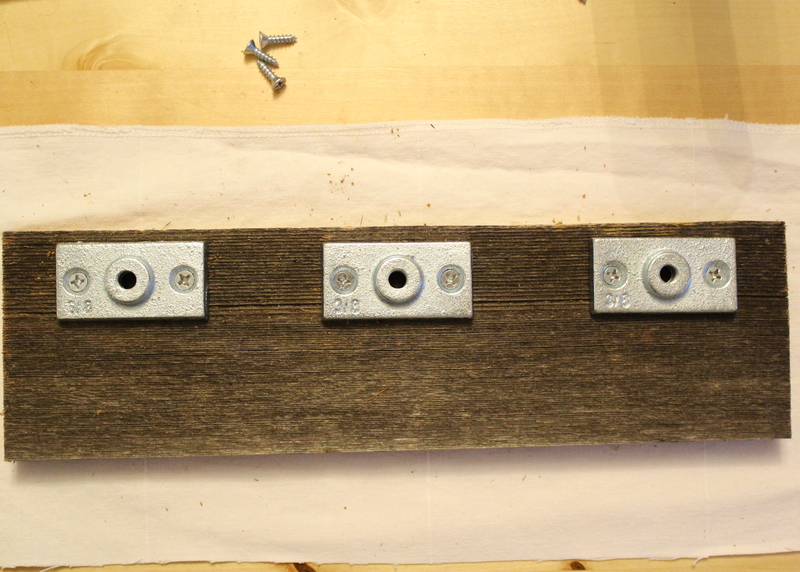 I drilled small pilot holes, and then screwed in the flanges. On the backside of the board I nailed in 2 picture hangers. I measured down just over an inch. In retrospect, I’d would have done it about half an inch from the top so it would hang a bit better. 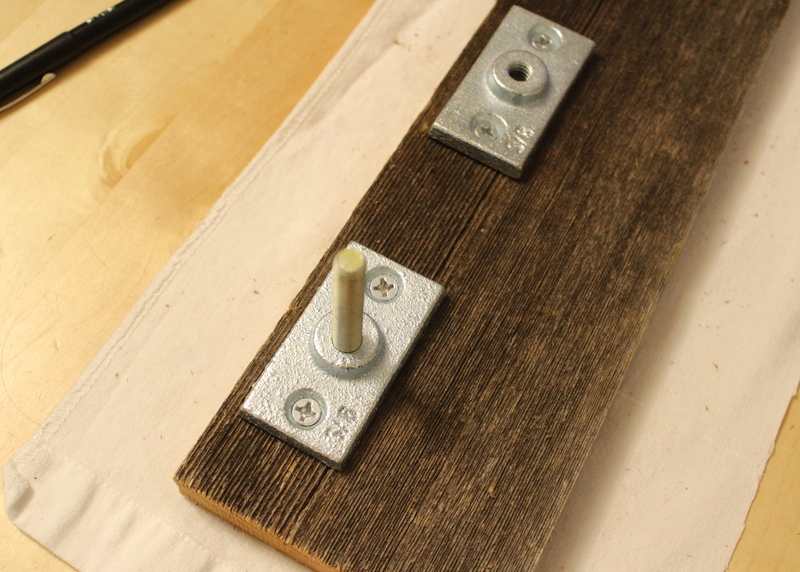 Using a hack saw I cut the threaded rod into (3) 2″ long pieces. This was the most tedious part…my shoulder still feels a little numb, like I got a massive flu shot! But once they were cut, it was all down hill! 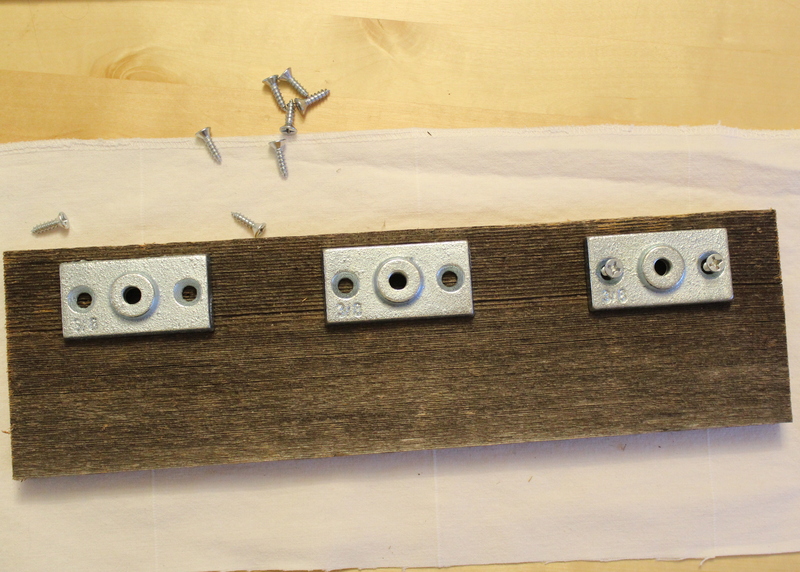 I screwed them into the flanges. 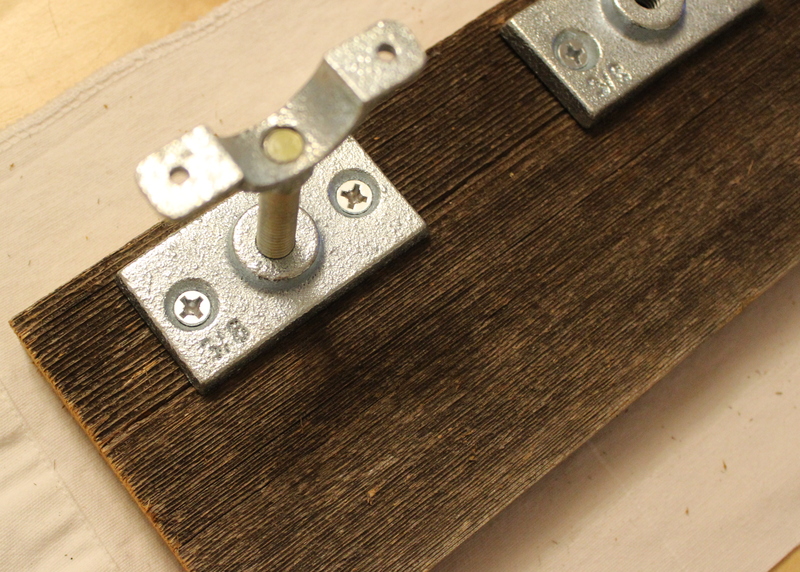 And then onto the rods, I screwed the hangers. 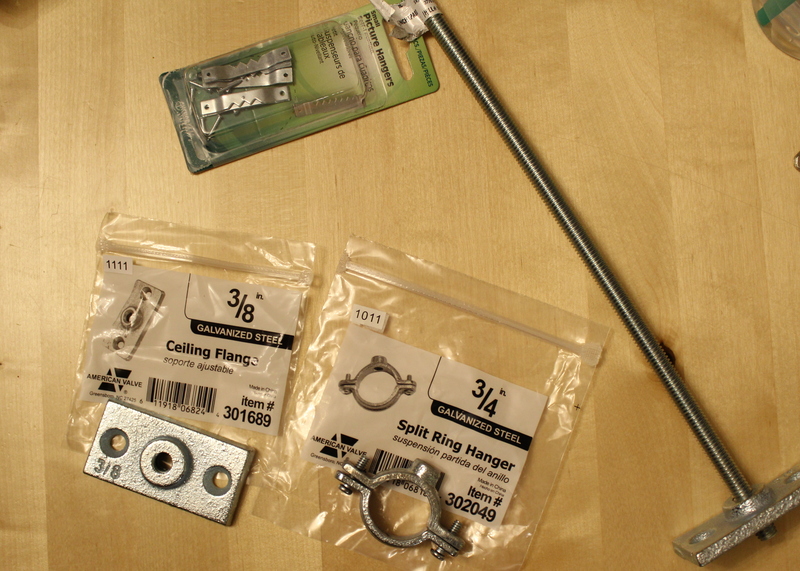 The hangers came in 2 parts with screws to assemble. 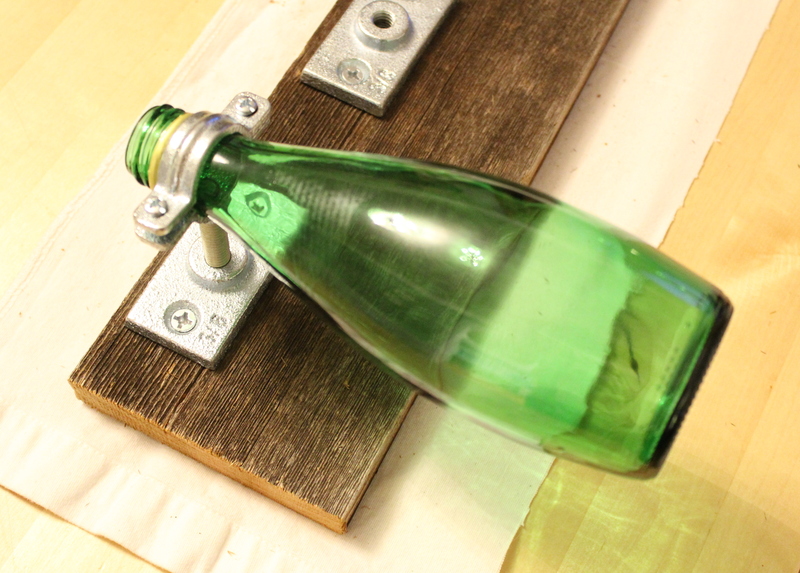 I placed the bottle on the hanger and assembled the hanger around the neck of the bottle. And here it is with the 3 bottles. Next and last step, hang and fill!! 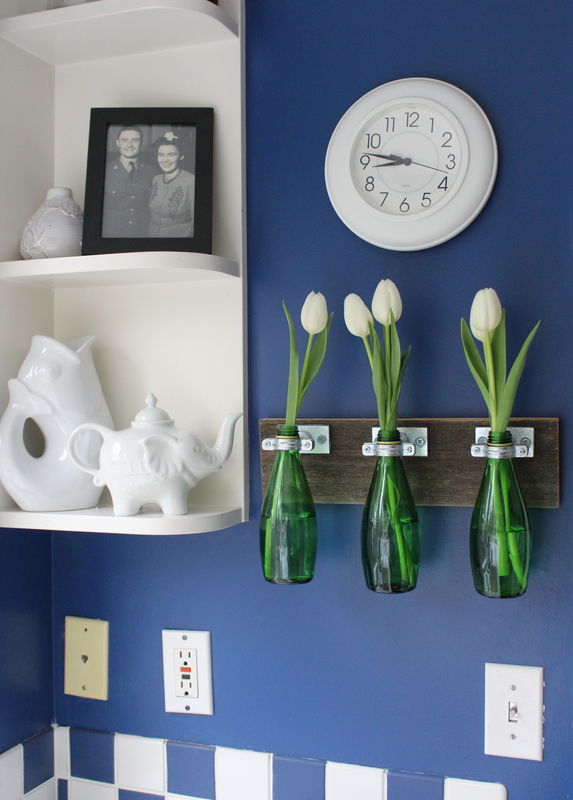 We have an empty wall in our kitchen that is screaming for more color! Mind you, white tulips don’t add much extra color I know, but in a few months I will have so many more colors of flowers to put in those vases, can’t wait!! I must mention the other thing I love about this is that it gets the vases off the counter. I am not a fan of counter clutter so this perfect for me! Did any of you complete the Pinterest challenge this season? I can’t wait to check out all of the other projects! Be sure to check them out today on YHL , Bower Power, Hi Sugerplum!, and The Great Indoors! Need a love button for this one! So So So very cool, I think I may have to try this!!! Love it! & I think this is WAY better than the other Pinterest Challenge too! p.s. It looks especially lovely where you hung it and with the white accents! Ah! Love it, Em!! Looks so amazing. It’s so pretty!! 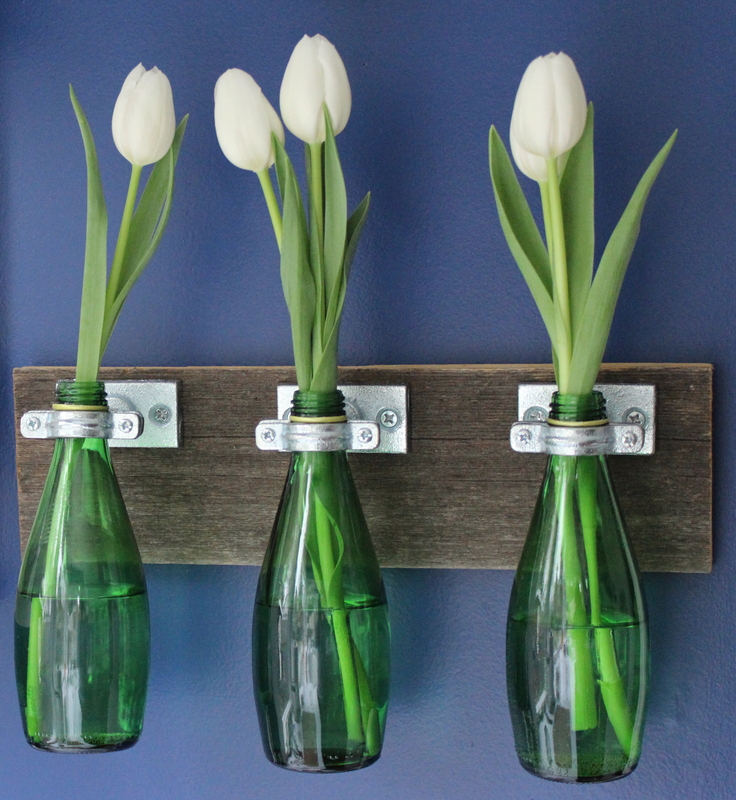 I love the white tulips against the blue walls. 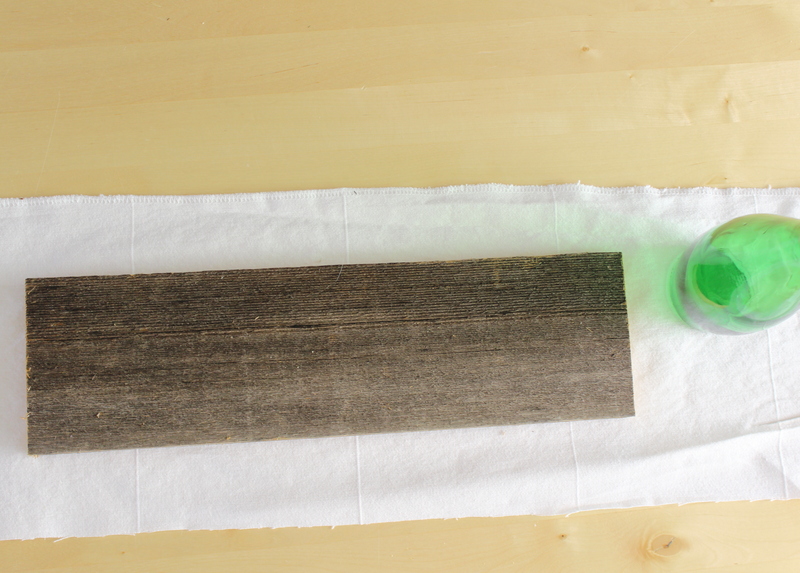 Also, the green bottles make it look so fresh and springy. I’m pinning this for sure! This is so cute! 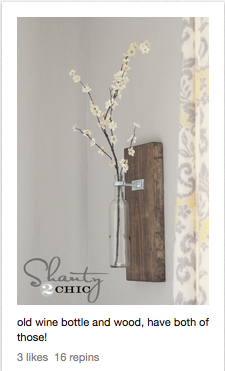 What a fun take on a bud vase … I love the wood and hardware. Cute! It looks so great against your blue wall. Great job, and thanks for linking up with the Winter Pinterest Challenge! 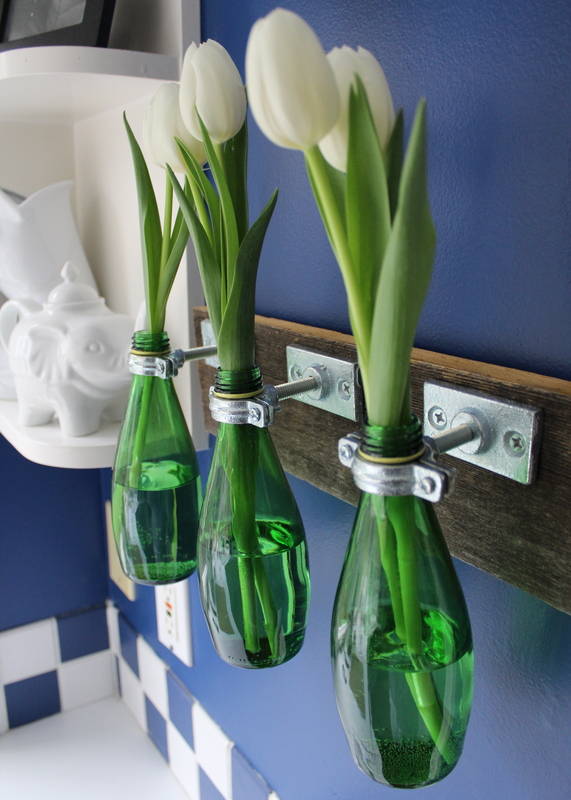 I love this idea, I have 3 empty bottles of Perrier sitting on my countertop just aching to be turned into something crafty! Thus I began searching for what I could do with them, came across your blog, and found a winner! Thanks for sharing! I love this, how much did the supplies cost?